All data from this channel should be used with caution as the values measured were unrealistic during this and several other cruises. Readings taken by the probe indicated that the sensor was constantly saturated. Users should be aware that the clear water values measured on different cruises are observed to increase and decrease at times, which is not consistent behaviour. In addition, the clear water scattering values are also sometimes less than and sometimes greater than those measured by the manufacturer at the time of last calibration (October 2006). This may be due to a problem with the instrument or the method in which the clear water values are measured. The CTD unit was a Sea-Bird Electronics 911plus system (SN P23655-0620), with dissolved oxygen sensor. The CTD was fitted with a red (660 nm) beam transmissometer, a fluorometer, a Sequoia Scientific Laser In-Situ Scattering and Transmissometry (LISST) particle analyser and a LI-COR Underwater Quantum Sensor. Also attached was a Sea-Bird SBE-35 Temperature Logger to supply an independent check of temperature. All instruments were attached to a Sea-Bird 32 compact carousel. The table below lists more detailed information about the various sensors. Change of sensors during cruise: None reported. Rosette sampling system equipped with 5 l sampling bottles (Sea-Bird Improved PVC Sample Bottles based on design of Ocean Test Equipment Inc. model 110 bottle). The Turner Designs SCUFA is a submersible fluorometer for chlorophyll and dye tracing operations that has been designed to operate in a wide range of concentrations, environmental conditions as well as operational modes (profiling or moored deployments). The instrument includes an integrated temperature probe and software which allow for automatic correction of fluorescence data from temperature effects. The superior ambient light rejection eliminates the effects of sunlight and allows the SCUFA to be used in surface waters without the need for external pumps or light shields. Each instrument can be customised to meet user requirements. Users can choose one of the following channels: chlorophyll a, cyanobacteria (phycocyanin or phycoerythrin pigments), rhodamine WT, fluorescein and turbidity. Instrument options include turbidity, internal data logging and automatic temperature correction. Three versions of the SCUFA are available: SCUFA I, II and III. SCUFA I and II are used for chlorophyll a applications, while SCUFA III is used for Rhodamine WT. Models II and III include a turbidity channel that is not present on model I. The SCUFA has been out of production since 2008. The table below presents the specifications for the different channels. Further details can be found in the manufacturer's brochure. The Sequoia LISST measures particle size distribution of suspended sediments by laser diffraction. This technique allows particles of various compositions to be measured with a single device and, because the particle volume is roughly of the same order for all sizes, the required dynamic range of the sensors is reduced compared with single-particle counters. The instrument includes optics for producing a collimated laser beam, a detector array, electronics for signal amplification and processing, a data storage and scheduling computer and a battery system. The primary measurement is the scattering of laser light at a number of angles, which is mathematically inverted to give a grain size distribution, and also scaled to obtain the volume scattering function. The size distribution is presented as concentration in each of 32 logarithmically-spaced grain-size class bins. Optical transmission, water depth and temperature are recorded as supporting measurements. Several models are available and although the principals of operation are the same, their specifications vary slightly. The specifications for model LISST-100 are provided below. 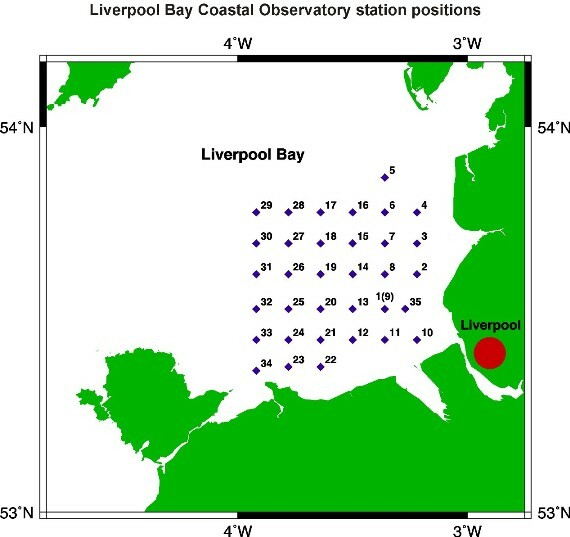 A total of 35 CTD casts were performed during the cruise throughout Liverpool Bay. Rosette bottles were fired near-bed on numerous profiles in order to obtain independent temperature and salinity samples, the results of which were sent to BODC. Water bottle samples were also taken from the near-surface and near-bed bottle and frozen for nutrient analysis (nitrates, phosphate, silicate) at the National Oceanography Centre, Southampton. Additionally, the near-surface samples were filtered to determine suspended sediment load by the School of Ocean Sciences. Some filtrate was preserved by mercuric chloride for nutrient analysis by CEFAS at station 1 (twice), stations 5-8 and 11. Data were logged at 24 Hz onto a PC running SEASAVE, Sea-Bird's data acquisition software. The raw Sea-Bird data, configuration and bottle files were supplied to BODC for further processing. The raw CTD files were processed through the Sea-Bird SBE Data Processing software version 5.35. Binary (.DAT) files were converted to engineering units and ASCII format (.CNV) using the DATCNV program. Sea-Bird bottle files (.BTL), with information on pressure and other logged readings at the time of bottle firing, were also generated during the data conversion process. Sea-Bird software program ALIGNCTD was run to advance conductivity by 0s and oxygen by 3s (within the typical range given in the Sea-Bird manual). No adjustment was made to the temperature channel as the fast sensor response time renders this unnecessary, according to the Sea-Bird literature. To compensate for conductivity cell thermal mass effects, the data files were run through CELLTM, using alpha = 0.03, 1/beta = 7, typical values for this CTD model given in the Sea-Bird literature. After running WILD EDIT, FILTER was run on the pressure channel using the recommended time filter of 0.15 seconds. Next, a minimum CTD velocity of 0.0 m s-1 was used for LOOP EDIT in order to exclude scans where the CTD was travelling backwards due to ship's heave. Salinity, density and oxygen concentration were then calculated and added to the output files using the DERIVE program. The files were then averaged to 0.5 second intervals using BINAVERAGE. Conductivity S m-1 Electrical conductivity of the water body by CTD CNDCST01 S m-1 Not banked by BODC. These data are used as an intermediate step in calculation of PSALCU01. Voltage 2 Un-adjusted volts Voltage from CTD PAR Sensor LVLTLD01 Un-adjusted volts Not banked by BODC. These data are used as source data for the calculation of IRRDUV01. Voltage 3 Un-adjusted volts Beam transmissometer voltage TVLTCR01 Un-adjusted volts Not banked by BODC. These data are used as source data for the calculation of ATTNMR01. - - Oxygen saturation OXYSBB01 % Generated by BODC during transfer using the Benson and Krause (1984) algorithm. Reformatted CTD data were transferred onto a graphics work station for visualisation using the in-house editor EDSERPLO. Downcasts and upcasts were differentiated and the limits manually flagged. No data values were edited or deleted. Flagging was achieved by modification of the associated quality control flag to 'M' for suspect values and 'N' for nulls. Once quality control screening was complete, CTD downcasts for all casts were binned against pressure at 0.5 dbar increments. During binning, BODC exclude flagged data and generate interpolated values to fill in gaps in the increment sequence, where necessary. Finally, the CTD downcasts were banked. The calibration residuals ranged from -0.191 to 0.3301. 115 independent temperature values were compared to pressure and CTD temperature. Two points were identified as outliers (casts C001 at depth 20.26m, C018 at depth 13.19m) and were removed from the analysis. The offset between CTD temperature and SBE-35 temperature was found not to be significantly different from zero at 95% confidence. Therefore, there was no adjustment to the CTD temperature resulting from the application of manufacturer's coefficients during initial processing. Where Tw is the percent transmission for pure water for the instrument (92.98%); W0 is the voltage output in pure water (4.649 volts); A0 is the manufacturer's air voltage (4.661 volts); Y0 is the manufacturer's blocked path voltage (0.000 volts); A1 is the cruise maximum air voltage (4.558 volts); Y1 is the current blocked path voltage (0.0000 volts). For this cruise, M and B were calculated to be 20.4520 and 0, respectively. Ideally the manufacturer's clear water values should be substituted by values determined by the LISST calibration cast, during which the instrument is placed in a tank of clean water. However, there is suspicion that these values may not be accurate. The clean water transmission and scattering voltages can be seen to both increase and decrease with time, showing inconsistency in either the instrument performance or the calibration dip method. Therefore, manufacturer's values have been quoted along with values measured by the instrument during previous cruises since the last manufacturer's calibration. Users are advised to use their own discretion in deciding which coefficients to apply.